Absolutely stunning 4 bedroom, 2.5 bath, 2 car garage dream home on over a quarter acre of land. 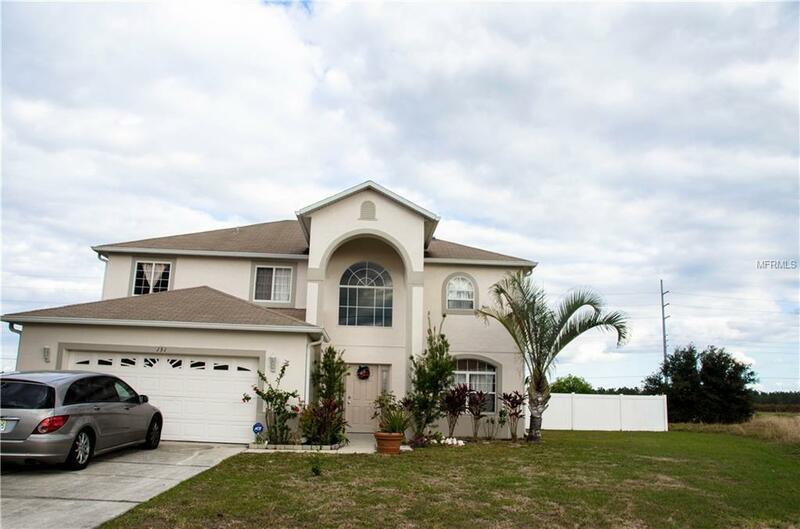 This home's over sized cul-de-sac lot is surrounded by views of untouched Florida farmland. As you enter the home, you are greeted by a soaring two story foyer. This home was built with a great layout, and includes a formal dining, family, and living room, as well as an upstairs loft. The beautiful dark cherry hardwood flooring in the living room will give your home bragging rights. 12" neutral tiles are laid in the mudroom, laundry room, kitchen and half bath, while pristine maintained carpet can be found throughout the rest of the home for your comfort. This home's kitchen was built with large open layout, and includes maple wood cabinetry with plenty of storage, a long breakfast bar, a closet pantry for additional space, and an eat in area large enough for a set of table and chairs. All bedrooms are located upstairs for privacy, with a split floor plan to the master bedroom which includes an en suite with his & hers walk in closets. The master bath features large jetted garden tub, separate shower stall and dual-sink vanity. You'll love entertaining in the large fenced in back yard. This community will welcome your family with open arms while you can enjoy many of the amenities within eye sight distance from your front door, endless parks and recreations. You won't want to miss seeing this dreamy home for yourself!